One good thing about the shutdown: it’s given me the time and mental space to do some writing, for the first time in a long time. Less than one month ago, I posted a story about white-nose syndrome killing bats in Mammoth Cave National Park. Today, more bad news came from another national park site, Cumberland Gap National Historical Park, where white-nose has just been documented for the first time. 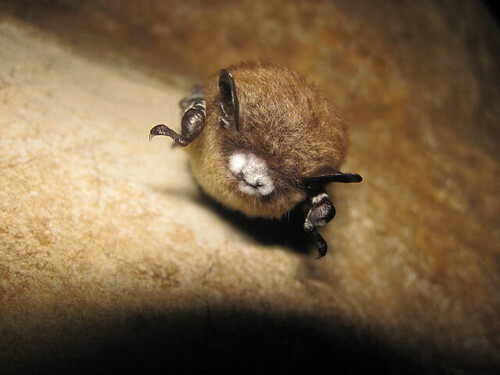 I contacted Katie Gillies, the imperiled species coordinator at Bat Conservation International, to ask what can be done to combat the spread of white-nose. "There is an extensive amount of research being conducted on several fronts right now," she told me. "A few years ago, the fungus didn’t even have a name, and today the full genome has been mapped, sensitive molecular tools to detect it have been developed, and we understand the histology of the fungal invasion and believe we understand the proximate and ultimate causes of death." The 112th Congress will not go down in history as having accomplished much for conservation, but one of its last acts on Sunday night was to pass legislation promoting Pinnacles National Monument in California to full national park status. Should the Manhattan Project become the newest site in the national park system? I didn't give much thought to America's prairies until I moved to South Dakota. I grew up loving the hardwood forests of the Mid-Atlantic and New England states, then discovered the great western mountains as a college student. The grasslands of North America were something I skipped over, believing them flat, unvarying, and dull. What little I knew of prairie came mainly from childhood. Fourth-grade geography lessons, Little House on the Prairie, and the favorite Apple IIe game of eighties educators, Oregon Trail—these were the sources of the vague impressions I had about an ecosystem that historically occupied more than 1.4 million square miles of North America. When I first came to work at Badlands National Park in 2008, the prairie took me by surprise. Far from being a pancake-flat plain with a boring lack of biodiversity, the grassland teems with life. On July 30, 1994, an angler caught a white-spotted fish, just shy of 17 inches long, in Yellowstone Lake. The accompanying guide identified it as a lake trout, a species previously undocumented in Yellowstone Lake, and notified park rangers. Less than a week later, a second lake trout of similar size was caught and reported. As news of the find hit the media, more people came forward to report lake trout. Yellowstone National Park recently announced that it had removed over 300,000 lake trout from Yellowstone Lake during its summer 2012 gill-netting operations. Yes, that’s three hundred thousand of the non-native, predatory fish pulled out of the lake, all in a single season. And many of them are real whoppers, like the one held by Park Service fisheries biologist Phil Doepke in the NPS photo at left.